As a dad, I’ve put in plenty of time at my kids’ hockey games. Without fail, after every game, both my sons love to indulge in the rink food court’s pretzels. They are not good, so we came up with our own recipe. To the uninitiated, making pretzels seems complicated, but it’s actually a pretty an easy way to learn the basics of bread-making. With a simple dough that comes together in minutes, the rest of the process is similar to making homemade bagels: shape, submerge, bake, snack. In the case of super soft pretzels, rather than boiling them, they are poached in a solution of water and baking soda. Though it might sound strange, the alkaline water makes the dough slightly gummy; once baked, it helps to ensure a chewy interior with an outer "crust" browned to perfection. This recipe includes instructions for how to make classic soft pretzels, but you can also use the dough to make soft pretzel buns, which are perfect for sandwiches or burgers. In either case, remember to give your Baking Steel a good 45 minute preheat..And make these for after the game.. In the bowl of a stand mixer fitted with the dough hook, combine the flour, sugar, salt, and yeast. With the mixer running on low, slowly add the warm water; mix briefly to incorporate. Add the melted butter, and mix on medium speed for about 4 minutes. 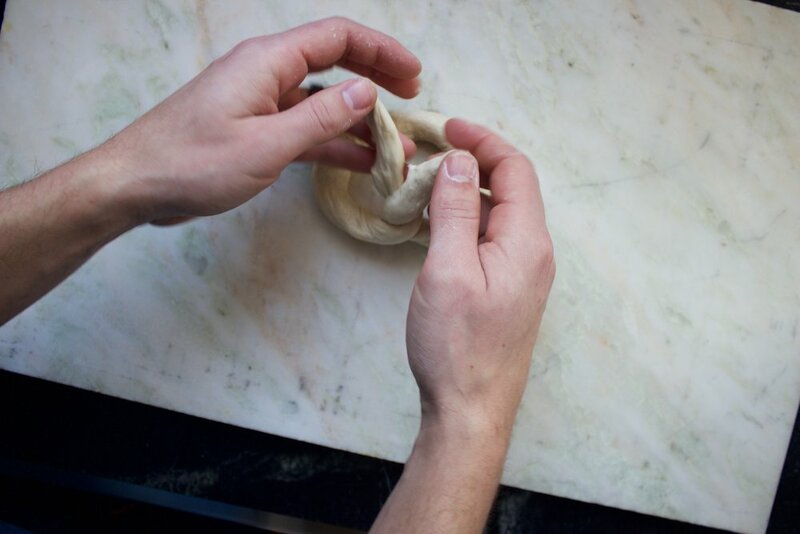 The dough will form a loose ball and pull away from the sides of the bowl. Transfer the dough to an oiled bowl, cover with a clean, damp kitchen towel or plastic wrap, and let rise at room temperature for up to an hour. The dough will expand to a little more than double its original size. Meanwhile, position a rack in the middle position of your oven and place the Baking Steel on top. Preheat oven to 450 degrees F for 45-60 minutes. Turn the risen dough onto a floured work surface. Portion the dough into 6 equal portions (about 145g each) for pretzels, or 12 equal portions (about 70g each) for buns. Shape each portion into a pretzel (see note), or form them into balls to make pretzel buns. Prepare the poaching mixture. Bring the water and baking soda to a boil; once the baking soda is dissolved, turn off the heat. Using your hands, drop your pretzels into the poaching solution and let sit for about 10-15 seconds; flip with tongs, and repeat on the second side. Be careful: the mixture is hot, and can stain your clothes. Remove the pretzels with a slotted spoon so that the excess liquid can drain off, and place them onto a sheet of parchment paper. Coat generously with pretzel salt. Either place your parchment onto a sheet tray and place on your Baking Steel, or use a pizza peel to launch the parchment directly onto your Steel. Bake for 10-12 minutes, rotating halfway through baking, or until golden brown (whether you’ve shaped them into pretzels or rolls, they will bake for the same amount of time). Remove from the Steel and transfer to a wire rack to cool. If you want, brush the pretzels with melted butter when you take them out for added flavor! Store well wrapped leftovers for up to 3 days, or freeze for up to 1 month. Extra credit: what is pretzel salt? Pretzel Salt is a coarse, large-grained salt that doesn’t melt quickly. Because it’s “sturdier” than typical coarse salt or even flaky sea salt, it’s the perfect choice for finishing salt bagels, bread sticks, or pretzels. If it is not available in your grocery store, use the coarsest salt you can find. 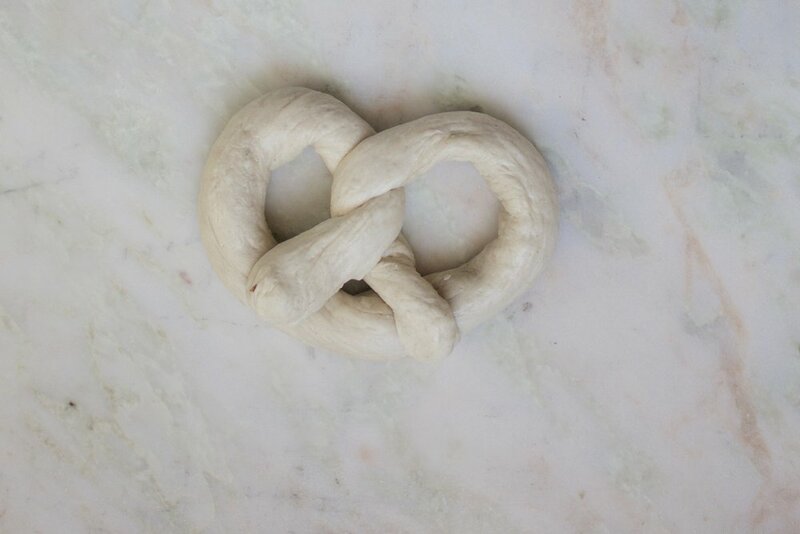 It may look like origami folding, but shaping pretzels couldn't be simpler. Here's how to do it in four easy steps. 1. Roll out the dough into a long, slender log. About 14 inches is a good length for this recipe. 2. 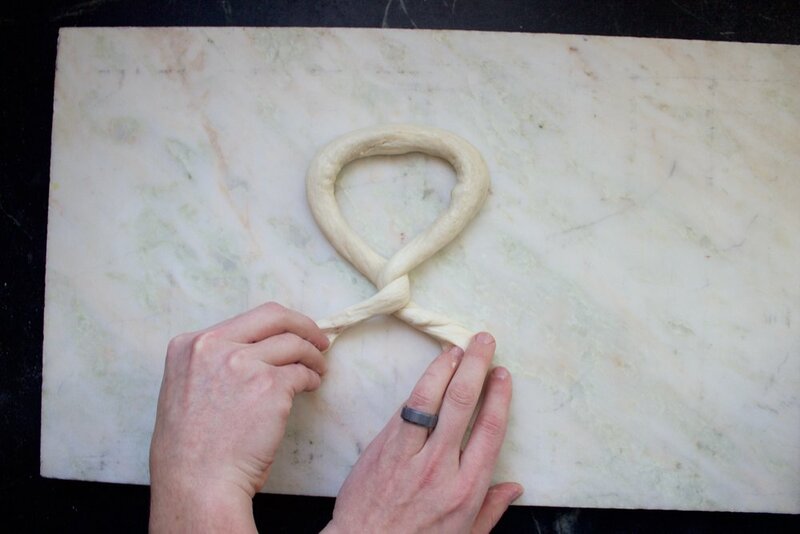 Gather the dough into a horseshoe shape, with the ends of the "U" pointed up. 3. Overlap the ends, leaving approximately 2-inch "tails," so it kind of looks like a ribbon symbol for a moment. You can coil once or twice more if desired. 4. Flip the overlapping ends down, so that they will meet the bottom of the rounded part. You'll see the familiar pretzel shape take hold. If the circles are too tight, use your fingers to widen the holes for a more pleasing pretzel shape. Click on the photo for a how to shape pretzels slide show.